In 1984, no other cityseemed more capable of reflecting the bright optimism of Ronald Reagan’s America than Los Angeles. The top-grossing films that year—Beverly Hills Cop, The Karate Kid, and Footloose among them—may not have been critical hits, but they gave audiences charming, quintessentially American heroes to cheer for. Those blockbusters also demonstrated how far Hollywood had put the moody ambiguity of the 1970s behind it. The most powerful seat of finance was no longer on Wall Street but on the fourth floor of Drexel Burnham Lambert’s Beverly Hills offices, occupied by junk bond king (and former head cheerleader at Birmingham High School) Michael Milken. The nation’s Cold War defense industry was centered in Southern California and made the recession less harsh here than elsewhere. Like the Polish-born peddler driven to become a real estate mogul or the alcoholic Jazz Age novelist seeking to stem financial disaster by trying his hand at screenwriting, the Summer Olympics that arrived at the L.A. Memorial Coliseum in the fading daylight of July 28, 1984, was in desperate need of reinvention. In 1972, West Germany had hoped that the Munich Games would showcase how far the country had moved past the supremacist spirit of Hitler’s 1936 Olympics in Berlin; instead athletic achievement was eclipsed by the deaths of 11 members of the Israeli Olympic team who were kidnapped by Palestinian terrorists. The 1976 Summer Olympics in Montreal—which would hamstring that city’s economy with crushing debt for 30 subsequent years—presented another cautionary tale. In 1980, at President Jimmy Carter’s behest, American athletes sat out the Moscow Summer Olympics in protest of the Soviet invasion of Afghanistan. Incredibly just two cities competed seriously to host the 1984 Games: Los Angeles and Tehran. When Ayatollah Khomeini’s revolution deposed the Iranian shah, Los Angeles lost its sole rival. There was precedence for Los Angeles believing that it could turn the tide. In the early 1920s, with Europe still devastated by World War I, L.A. was the only major city willing to bid for the 1932 Summer Olympics, held at the height of the Depression. President Herbert Hoover stayed away from the opening ceremonies. That was hardly the case for Reagan, whose own trajectory—from over-the-hill studio actor to Barry Goldwater zealot to California governor to president—remains Hollywood’s most compelling reinvention story. On that day in late July, no one seemed to notice much the president’s wobbly delivery as he looked down on the pageantry of the Coliseum and formally opened the Games. Under the stewardship of future Major League Baseball commissioner Peter Ueberroth, the Los Angeles Olympic Organizing Committee implemented Reagonomics with greater cost-effectiveness than Reagan himself did. Forbidden by a local referendum from drawing on taxpayer money, Ueberroth and the committee executed a masterpiece of privatization—cutting down on new construction in favor of sprucing up the city’s existing infrastructure for the Games. The main arena, the Coliseum, had served the same purpose during the 1932 Olympics. Southland Corporation—the corporate parent of 7-Eleven—ponied up for the velodrome in Carson, while AT&T partly funded the passing of the Olympic torch. ARCO, McDonald’s, Nissan, and Coca-Cola all bought underwriting opportunities. Instead of debt, organizers of the 1984 Olympics would take away from the Games a $215 million surplus. Despite some dire predictions, most Olympic venues were packed. More than 5 million spectators attended the Games. Without fierce competition from the USSR and Soviet bloc countries, American athletes trounced the competition. Mary Lou Retton on the vault, Carl Lewis on the track, Greg Louganis on the diving board—there weren’t enough Wheaties boxes in the world to contain their triumphant smiles. L.A., too, was a made-for-television triumph. The Games sparked an explosion of municipal pride that was unique in the city’s history. Residents thronged the sidewalks to witness the Olympic torch’s odyssey. They took a hiatus from their cars in favor of stadium-bound buses, and collected and swapped souvenir pins at USC’s Olympic Village with a seriousness out of proportion to the endeavor. The city had never attained the kind of visual coherence achieved by architect Jon Jerde and designer Deborah Sussman that summer. The deployment of the duo’s crisp iconography and bright palette—on flags, signage, arches, and conical tents that materialized on seemingly every street corner—knit together what had before been merely sprawl. The L.A. Olympics also brought the country together at least temporarily. In Time magazine Kurt Andersen wrote that the Games enabled Americans to “celebrate as they had not done in a long time.” As a vindication of Reagan’s vision, the Games may have helped him win a second term, despite ongoing economic pain for most Americans and incompetence and infighting among his cabinet members. Just weeks after the closing ceremonies, Jerde and Sussman’s creations—made largely of cardboard and scaffolding and not meant to last—disappeared from the landscape. L.A.’s Olympian luster faded almost as quickly. Even as Retton and Lewis were earning their places in the record books, the LAPD under chief Daryl Gates was in the midst of “Olympic Gang Sweeps”—the jailing of thousands of young black men—ostensibly to minimize gang crime during the Games. By the fall, crack cocaine had begun its devastation of South Los Angeles. Local aerospace jobs started hemorrhaging after Reagan ended the military buildup in 1985. The Olympics, however, did bring some lasting good. Profits from the Games still fund after-school sports programs in underserved areas. 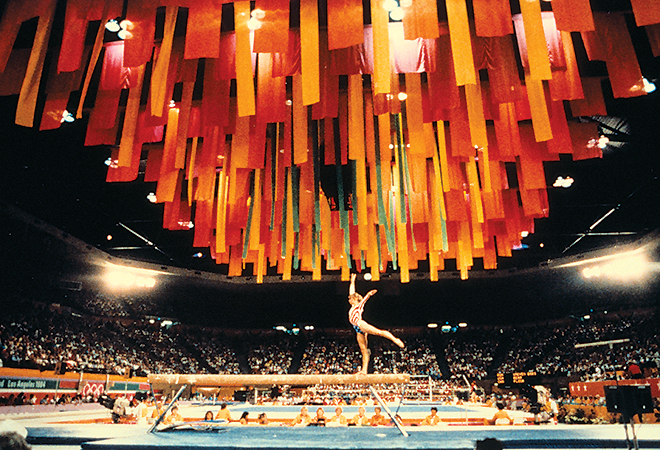 In 1988, four years after L.A.’s deadly air quality became a go-to topic for worldwide pre-Olympics coverage—and the blue skies of the Games proved what a serious mitigation program could do—Governor George Deukmejian signed the California Clean Air Act, which set goals, methods, and timetables for reducing pollution. For those locals who gladly succumbed to Olympic fever half a lifetime ago, the summer of 1984 remains more than a fond memory. A wellspring opened in a city whose reservoir of meaningful social engagement seemed so often to run dry. For 16 remarkable days we were invited to move beyond daily isolation and have everything to do with one another. We drank deeply.